It's amazing how things that are environmentally savvy also tend to be economical. Almost four months ago I entered into a new phase of life. I became a mum. It has been exciting, rewarding, exhausting, and illuminating. One of the biggest surprises was discovering just how often a newborn baby 'goes to the bathroom' and just how expensive single-use diapers are. I had no idea. It didn't take me long to learn that it's not unusual to change a baby as much as ten times a day which over the course of a year amounts to over 3500 nappy changes. For babies like mine that seem, to fill up a nappy that was put on just five minutes earlier, that number might be far higher! By the time a child reaches that most highly awaited milestone of being fully toilet trained, most parents will have paid over $3,000 for single-use nappies and that doesn't include the cost of wipes. Not surprising, the environmental ramifications associated with nappies are frightening as well. 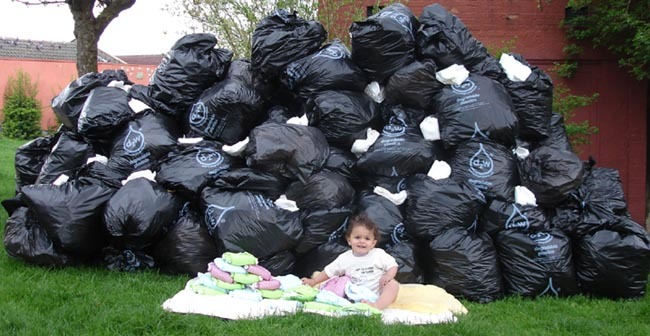 In the United States alone, enough single use nappies are disposed of each year to fill Yankee Stadium 15 times. And as a non-biodegradable product, that means that this giant mass of diapers just sits in landfills, growing year after year, generation after generation. The feces contained within the nappies also leak out and contaminate ground water but that's an even bigger can of worms that we'll open up another time. As a greenie from way back, I was always planning to use cloth nappies when I had children but I'll admit the process of actually doing this had me pretty intimidated. Most of the baby supply stores in my area didn't carry cloth nappies and the Kmart and Big W type stores only sold the old fashioned ones that my mother's generation used. They are basically square shaped towels that you fold and pin yourself in a form of bum origami. I did buy a few packets of these but, in the end used them mostly as burp cloths. After my baby had finally arrived, I stumbled upon what are known in Australia as "Modern Cloth Nappies" or "MCNs". They cost anywhere between $10 and $30 a piece and are easy to use, come in lots of different colours and patterns (so great for an Australian summer - who needs clothes! ), and best of all - can be adjusted in size to fit your little one from the time they are about one month old until they are fully toilet trained. There are many types of MCNs. The ones that I use have a pocket in the back where you insert a large, absorbent microfibre pad. The moisture from the urine gets sucked into this pad and your baby's bum stays dry. There are also many nappy companies run by what the cloth nappy community call "WAHMs" (Work at Home Mums). Supporting these companies gives you the opportunity to not only save yourself some money and help the planet, but you also get that awesome feeling of knowing you've just helped out a fellow mum. I purchased most of my nappies from one such WAHM company called Little Aussie Monster for $10 to $15 a piece. 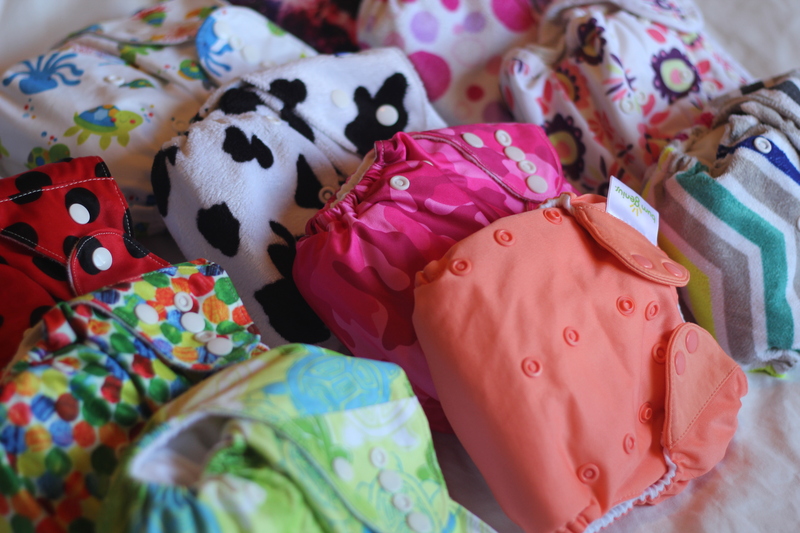 I didn't have enough money to purchase enough nappies all at once to move into cloth straight away (most people recommend you have at least two dozen cloth nappies for a newborn - less for a toddler). Instead, I would buy two or three nappies each payday until I built up a collection large enough to kick disposables out of my life completely! I'm only a few months down the cloth nappy road but I'm really surprised by how much I am enjoying it. I find that the cloth nappies do a better job at preventing blow-outs than the disposables and are much more stylish. If I were to move back to disposables at this stage in the game, it would be like exchanging all of my clothes for plastic hospital gowns! I just could not do it. What has been your experience with cloth nappies? Carly Wilson is a filmmaker and environmental professional specialising in wildlife care and habitat management. She also blogs on her personal website. Right now she is making a film about the effects of released helium balloon on the marine environment. Please follow her on Twitter (@carlycreature) or through Facebookif you would like to keep abreast of the film's progress.